The What: Lectrosonics has introduced the SRAES3 bottom plate adapter for all SR Series dual-channel slot receivers, including the SRc, SRb, SRa, and SR, and the 5P variants of these units. The What Else: The SRAES3 will work with all SR receiver versions to provide audio in the following formats: AES3 digital audio at 48kHz sampling with an internal clock; AES3 digital audio with an external word clock at 44.1, 48, or 96kHz sampling; and balanced analog audio from -50dBu to +5dBu in 1dB steps. One or two channels of digital audio are delivered from the CH1 jack, while the CH2 jack delivers analog audio at all times. The standard multi-pin interface and mounting holes are the same on all SR Series receiver output adapters. External word clock can be fed to the SRAES3 via the BNC connector. A 75 ohm termination of the word clock connection is applied by a field changeable jumper, installed by default at the factory. The housing is machined from a solid aluminum billet and hard anodized for ruggedness. The Bottom Line: "The SRAES3 further expands the already vast array of accessories for the very popular SR Series receivers," said Karl Winkler, vice president of sales at Lectrosonics. 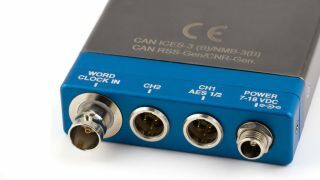 "Now, SR receiver owners can connect their units directly to digital inputs and even use a master word clock to run at 44.1, 48, or 96kHz sampling rates. With AES, they can eliminate two gain stages in their signal chain, reducing the possibility for error."